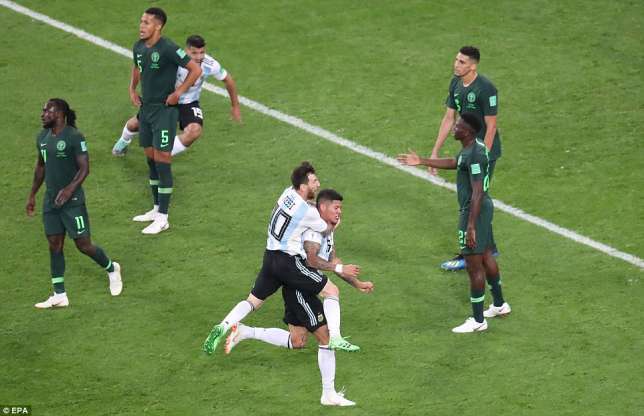 Sports Rendezvous: Nigeria 1 Vs 2 Argentina: Brave Super Eagles crash out of World Cup 2018. Nigeria 1 Vs 2 Argentina: Brave Super Eagles crash out of World Cup 2018. The Super Eagles are heading home after falling 2-0 to Argentina in Saint Petersburg on Tuesday. The Super Eagles of Nigeria have crashed out of a major tournament, but this time, there is no ‘going back to the drawing board’ rhetoric which has been used umpteen times, the players are not being vilified-well except one of them- and Nigerians are actually pointing fingers to the referee. This is because the Super Eagles of Nigeria did almost everything right. They played with their hearts, were disciplined and held their own against some of the best players in the world. But sometimes the best isn’t enough. Tiny details not being attended to messes up the performance and that is exactly where the Super Eagles are right now.